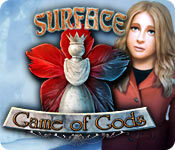 Surface: Game of Gods is rated 3.9 out of 5 by 29. Rated 5 out of 5 by BooksandGameFan from I'm so glad I finally played this game!! I'm going to keep my review brief since there will probably be few if anyone reading reviews on these older game, but for anyone who does, this game was fantastic!<P> I demoed it twice over the last 2 years and felt it wasn't for me but this past weekend I got on and old games kick and started playing all the older Surface games and WOW are they awesome! Far better than any of the newer games I've played in the last year and I've played some good ones!<P> Give it a try even if you just use a free game coupon, I really think you will enjoy it, I know I did! Rated 5 out of 5 by gamesrgreatfun from Great Storyline That Breaks Away From the Usual Fare I had fun playing this game. The first few minutes of the game, however, I wasn't sure I wanted to buy it! But I stuck with it and everything gets amazingly better after you enter the "game" and start trying to save your friends! The graphics were very good (after you enter the "game") It is a fun game that I am sure I will replay sometime. (I rarely replay games so that is saying a lot for this game) The mini-games were awesome and some of them were somewhat challenging and others very easy. The whole game was somewhat on the easy side but the storyline made up for that. I would have liked most of the mini-games to be on the hard side to make it seem more challenging to rescue your friends but I still enjoyed it. I recommend the game and wish there were quite a few more games with storylines that break out of the cookie-cutter molds of most HOGS. Rated 5 out of 5 by Yurnmesis from Excellent Graphics. Well developed and entertaining game! Excellent graphics, HO games with clear objects, mini games easy to somewhat complicated. You are offered an option to change Gamma to lighten or darken which I really like. Storyline was a change of pace from the usual fairy tale or macabre. The scenes were very well developed and logical and the backstory is explained so you are clear on the “why.” The game used cards to propel you forward into quite superb and creative scenes. There were numerous mini games leading into HO games, so plenty for everyone. Only critique is that the game ended abruptly, but the bonus game picks up where the game left off. That said, the bonus game was excellent, but it too ended abruptly. Would have been nice to have a little bit more closure, but then it was a happy ending. Rated 5 out of 5 by vanenkrieg from Masterpiece in its genre. The complexity of this one is set quite high and the plot is pretty sophisticated, compared to other hidden-object adventures. The graphics craftmanship is breath-taking in most locations, while well-balanced sound completes the overall atmosphere. Can't complain. Rated 5 out of 5 by denniann2 from great game it has a custom level. an interactive map, wonderful hint system if you want it simple. you have been invited by your friends to an old mansion for a game of some sort where you get paid. by the time you get there 2 are gone and shortly the third is dragged away. it is up so you to find them and save them. you work with a sheriff when you get there. you wind up going to different worlds to get your friends back. sequel.....i believe so!!!! Rated 5 out of 5 by sealsbroken13 from Go for the CE or don't go. Love this game,but I got the CE and in this case glad I did,the main game is real short, I mean real short, about 3 or 4 hours short,half of the story is in the bonus round and like wise half the game it is risky you get a rep like that and you cut your self down to nothing but the CE players after a while. I mostly buy the SE but I loved the game's story and art and Game play,so I brought the CE and when I found out how short the game was, I would have been so very mad at the developers I might not have bought from them again. But I bought the CE and on this game that really really makes a difference. Half the story how it got started and how the white queen came into play and who the game watcher was and how he became the game watcher is all in the bonus game. Also in the main game there is no where near enough flowers for fixing up your apartment. I am not yet done with the bonus game which looks to be as long as the main and already so glad I bought the CE great story and great game, but think I will be hesitant to buy anything but their CE from now on, The main (SE) does give you an ending. But if you want the whole story and enough flowers to do half of your apartment and enough time to really enjoy the game then go for the CE or don't buy it. Rated 5 out of 5 by pennmom36 from The Game You Cannot Win After playing both versions, I believe this Standard Edition is probably the better value, unless you simply must have all the extra bling and Strategy Guide available in the Collectors Edition. This is a recap of my original review of the Collectors Edition so that you can easily choose between the two versions. This isn't a Mystery of Another World, this is Reel Life! Nestled high above The Soaring City lies the Pantheon, a gothic building surrounded by majestic gargoyles. Four friends unknowingly volunteer to roll the dice in the Game of Gods, a deadly game! Alice Russell was running 20 minutes late, but the game waits for no one, by the time Alice arrives it's already too late for Jim and Kevin, they are already deeply engaged in this life changing game. It's Maggie's turn to roll the dice, "I have no choice, I must roll the dice!" In the blink of an eye, Maggie is dragged off into a surreal jungle by an axe wielding maniac! If you want to save your friends, you too must roll the dice, choose your pawn wisely, Mage, Farmer, Hunter, Blacksmith, Scientist, Noble, or Pilgrim, each has it's own unique quality! The player who reaches the end alive will save himself/herself and all other players, but I've a feeling this game isn't designed for winning. Scream all you'd like Alice, nobody outside this realm will hear you! Once she is buried alive, HELP will be the Noise she Couldn't Make! (didn't think I could do it eh?) I have to give kudos to whomever is responsible for the script here, simply wicked! The game starts out a bit slow with mundane tasks in the form of a Hidden Object Scene where you pack your purse, enter your password into the laptop and print off documents. 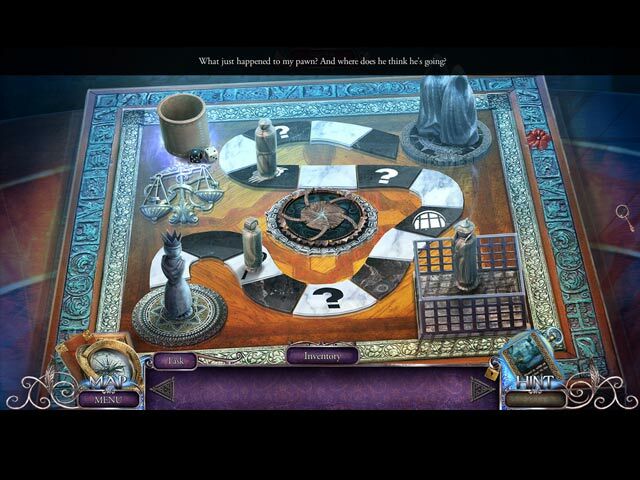 Alice must survive because she is being interrogated by a Detective, or could this be part of the game? Once Alice rolls the dice, hold on tight, the game definitely improves. You will collect two flowers in each scene, (Collectors Edition only) one white one red, in typical Surface tradition and you can use those flowers to decorate your humble abode with items of various flower counts. You will also find collectible statuettes of the different characters (Collectors Edition). Some of the inventory items are Complex Objects which simply means that that item requires some sort of interaction before it can be used. 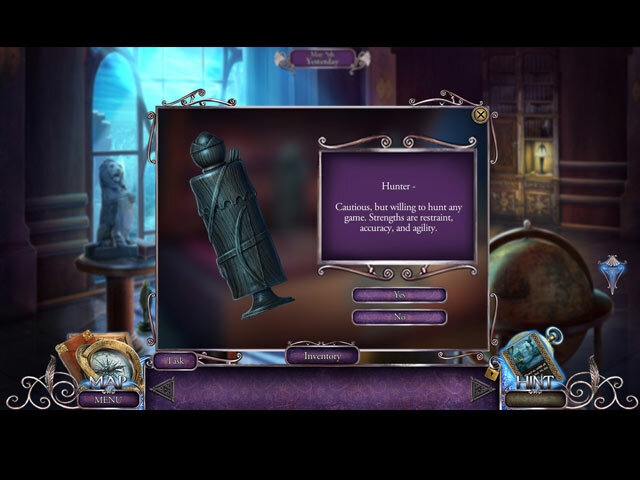 (this feature is available in both versions) The Hidden Object Scenes were extremely varied, so just to name a few, there are scenes where you find multiples of items such as 3 goblets and 3 swords and each item found will reveal a fragmented piece of the final item, some require you to move two objects at a time which reveals the object you are looking for underneath, as you try to match the two related items such as two whistles, there are also list finds with mini games to complete as well. The mini games were decent too, some are simple puzzle pieces to rotate, some require you to slide tokens along a path to their correct slot, all of the games seem fairly easy yet fun. (HOS and Mini games are the same in both versions) If you simply must have the Collectors Edition bling, the following is available in the Collectors Edition only. There are Collectible figurines, Collectible Flowers, A Bonus Room (apartment) Achievements, Wallpaper, Screensavers, Concept Art, Music, a built in Strategy Guide and of course a Bonus Chapter, let the games begin, enjoy! Rated 5 out of 5 by CameoLove from Let the games begin I really enjoyed this one. I love games and being able to go into one was really clever. The story was such a fun idea. I also immediately thought of Jumanji and I loved that movie. 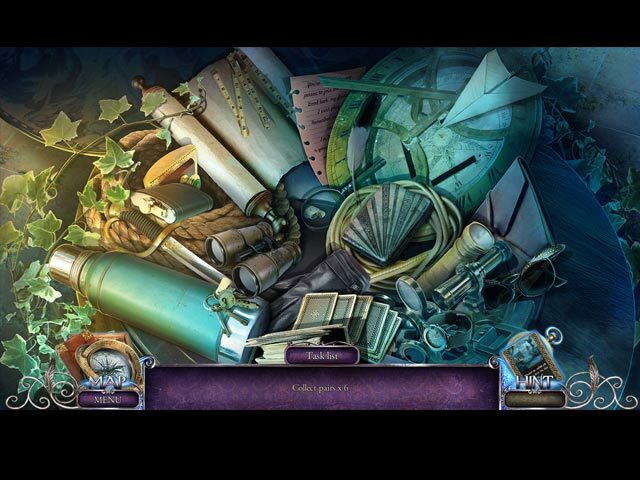 As others have said the hidden objects were different and entertaining. They were all very easy (which I appreciated) and none of the puzzles were very challenging, but the fun factor was outstanding and the graphics were good.